NABS is the National Auslan Booking and Payment Service. NABS provides services Australia-wide and is based at the corporate office of Wesley Mission Queensland. NABS provides interpreters free of charge to any person who uses sign language to communicate and would like to book an interpreter for private health care appointments. Q: Is NABS a free service? Q: Where does NABS get its funding? NABS is funded by the Australian Government Department of Social Services. Visit the Department of Social Services website for more information. Q: How can I contact NABS? There are 7 ways to contact NABS. Q: When can I contact NABS (NABS operating hours)? NABS operates nationally between the hours of 8am and 6pm Monday to Friday, excluding all national Public Holidays. Click here for NABS contact details. When you make a health care appointment either you or your doctor can book an interpreter. Q: Can I have a NABS interpreter? Q: Can I have a NABS interpreter at the hospital (Public and Private)? A NABS interpreter can be booked if you are seeing your doctor at the doctor's private consulting rooms at the hospital. If a doctor comes to the hospital ward to see you then NABS can NOT provide a free interpreter. If you are a Deaf consumer or a Health Care Provider the Australian Government Department of Social Services provides funding for interpreting services at private medical and health care appointments. This is a FREE service to Deaf consumers and Health Care providers. This service is provided under the Disability Discrimination Act 1992. Also see Letter To Your Doctor. Q: How do I become a NABS interpreter? NABS employs NAATI accredited interpreters at Paraprofessional (formerly Level 2) and Professional (formerly Level 3) levels and Deaf Relay Interpreters who have either satisfied the criteria of the NABS/ASLIA DRI testing process and/or have certification via a state based DRI training program. For more information see the Interpreters section of this website. Q: What services does NABS cover (when can I use NABS)? Q: Is NABS for kids? Yes. Parents and Carers can ask NABS to book an interpreter for private medical and health care appointments for their children aged 0 to 18 years. Q: Is NABS only for Bulk Billed Appointments? Q: Will NABS book my appointments for me? No. It is not NABS responsibility to make appointments with the doctor or health care practitioner for you. NABS will organise an interpreter to attend your appointment if requested by either you or your health care provider. Q: Will NABS cancel or change my appointments for me? No. It is your responsibility to manage your appointments. Q: Do I tell NABS if my appointment is cancelled? Yes. NABS will need to cancel the interpreter and tell all parties why we cancelled the interpreter. Q: Can I book NABS for other appointments? 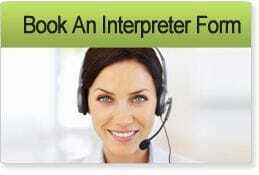 If your appointment is NOT a medical or health care appointment NABS cannot book a free interpreter for you. ALL interpreting services for both public and private health care appointments are provided FREE to Aboriginal and Torres Strait Islander Sign Language users. Skype is software that you can download. It allows you to make voice and video calls over the Internet. Skype is used for Video Remote Interpreting. Deaf Interpreters work with consumers who have additional or unique communication needs, are Deafblind or are Indigenous Deaf people. Deaf Interpreters work with Hearing Interpreters to facilitate communication. For many social, cultural or medical reasons some Deaf consumers have extra communication needs. Some examples are developmental delays; serious illness that may affect clear signing; limited exposure to English and/or Auslan; Deaf Indigenous Sign dialects/tactile sign language. Q: What is the difference between a Deaf Interpreter (DI) and a Deaf Relay Interpreter (DRI)? Deaf Interpreters were previously referred to as Deaf Relay Interpreters. There is no difference. Visit the ASLIA website for more information on Deaf Interpreters. Q: What if a Doctor or health service says I don’t need an interpreter but I want to book one? You can contact the Health Complaints Commission in your State or Territory. It is your right to have an interpreter present. All complaints and feedback about NABS is important. It helps us provide you with a great service. You can fill out our online feedback form or email NABS. All complaints and feedback NABS receives is strictly confidential. Q: Does NABS keep my personal information confidential? NABS abides by the Privacy Act 1988. All information remains private and confidential. No information is disclosed to any person who has no right to see it. Q: What is NABS Privacy Statement? The National Auslan Interpreter Booking & Payment Service (NABS) respects the privacy of all persons who utilise its functions and services. We are bound by the Australian Privacy Principles (APPs) in the Privacy Act 1988 (which regulate how organisations may collect, use, disclose and store personal information and how individuals may access and correct personal information held about them). You can see the complete NABS Privacy Statement HERE.